From mountains and barrier reef islands, to prairies and sand dunes, experienced winter campers say these 10 destinations are at the top of their list. If you go camping in a cold location, it’s generally pretty easy to stay warm, given all the modern clothing and sleeping bag materials designed to wick away moisture, while keeping the heat in. Some winter camping takes place in warmer areas of the country–that is, areas where summertime is often too hot for serious hiking. Because it’s not “high season,” you’ll encounter fewer crowds and more silence. So just pack your backpacks and do it! Save up to 50% off Campgrounds all over the world with Booking.com! But where should you go winter camping? To find the best spots in the USA, I picked over the Internet to find the destinations that adventure buffs consider the best in terms of beauty and wildlife interest. Here are 10 places that came up many times. Each offers year-round campgrounds, a variety of trails (many of which are family-friendly), and a huge dose of serenity. A good solution for saving money is to book in advance where possible, then grab a last-minute cheap flight. Just make sure you have all the gear you need before you hop on the plane. 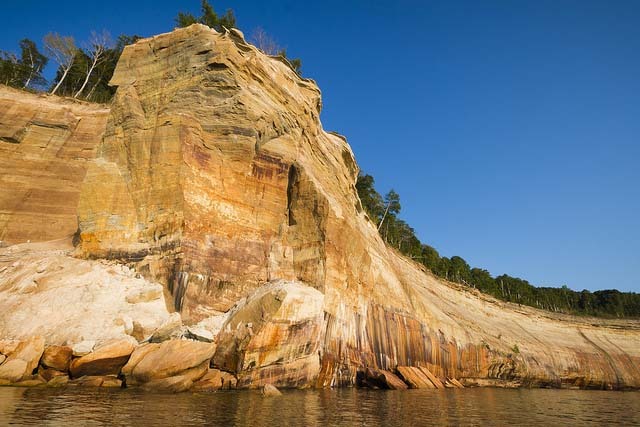 At Pictured Rocks, the main attractions are the stunning sandstone cliffs, waterfalls, sand dunes, lakes, and forest. It’s on the shore of Lake Superior, along 40 miles of coast. In winter some roads are closed to cars because of snow, but snowmobiles are allowed. There are 14 backcountry campsites, all first-come, first-serve. Make sure to check for current conditions before you plan your trip. Open year-round. >>Check out what’s on Sale at Camping World! Hundreds of Items – Huge Savings. Click here to shop! Mt. 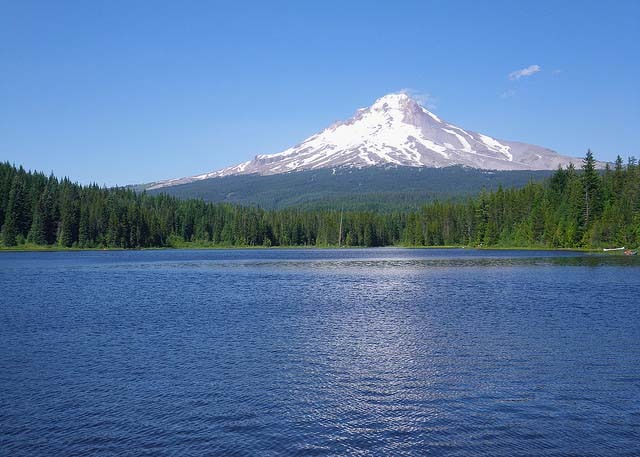 Hood is only 25 miles east of Portland and densely forested, extending south from the beautiful Columbia River Gorge. The mountain is 11,239 feet tall (3,426 meters). When you’re planning the trip, check the USDA website for a list of the campgrounds that are still allowing campfires, so you don’t get left out in the cold. You can reserve by going on this website. Also, note that there are designated winter parking areas. You can get more details about how to buy a winter pass here. 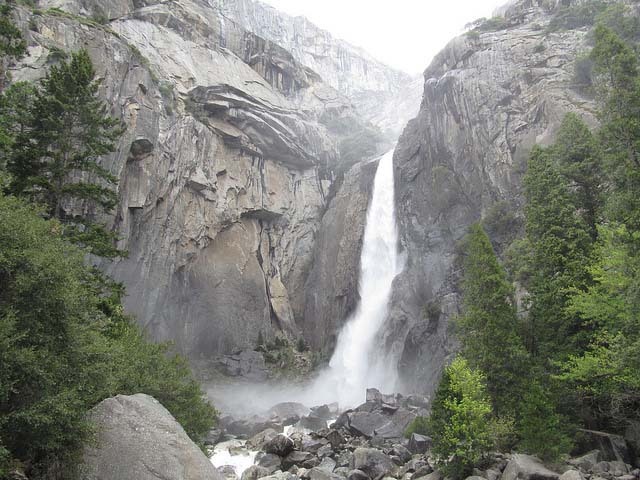 When it comes to Yosemite, you need to plan around the trails that are closed in winter. Yosemite Valley and Wawona are accessible to cars year-round. Expect Tioga Road to be completely closed; Glacier Point is closed to cars 5 miles in, where it becomes a snowshoeing and cross-country skiing trail. 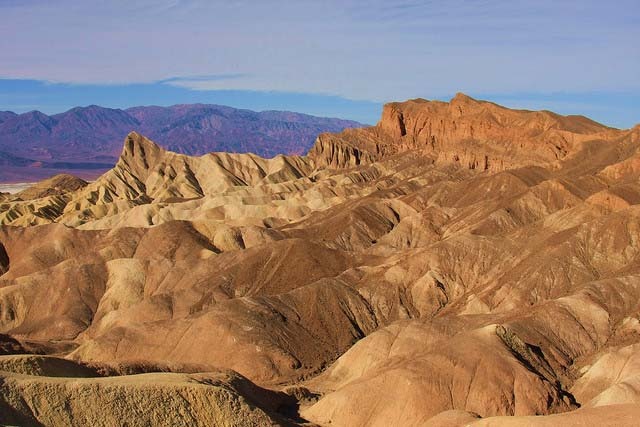 Death Valley has the largest amount of national park wilderness in the continental U.S. (more than 3 million acres of it). You can visit it year-round, day or night. Daytime temperatures are often in the 60s, and can get very chilly at night. For alerts and current road conditions check this page. 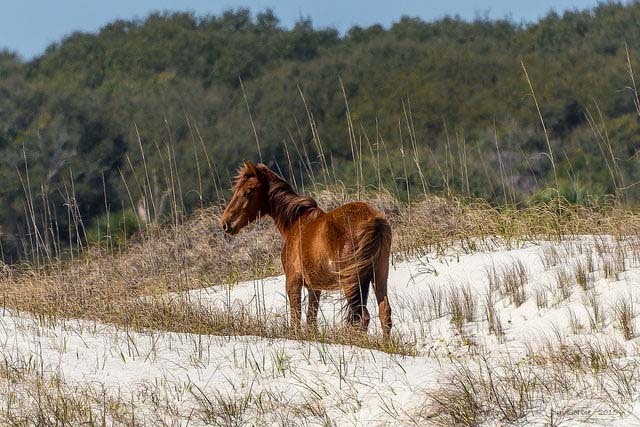 This 50-mile barrier island includes wild horses running on the beaches. Camping per night on Cumberland is cheap and it’s a short boat ride from the mainland, but you should try to book well in advance. For detailed information about restrictions, read this page. To book a campsite, visit this page. Note that campfires are only permitted at Sea Camp and Stafford Beach. 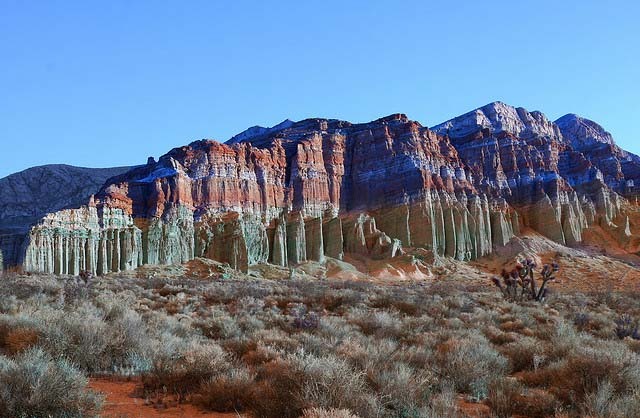 The Red Cliffs of Red Rock Canyon State Park help to keep out some of the cold winter wind. The park is located where the El Paso Range meets the southernmost tip of the Sierra Nevada, and is open year-round. Family-friendly trails will lead you through red rock formations and past narrow canyons filled with water. You can camp in one of the 50 developed, but primitive, sites in Ricardo Campground. Camping is first-come first-served; you can’t make reservations. 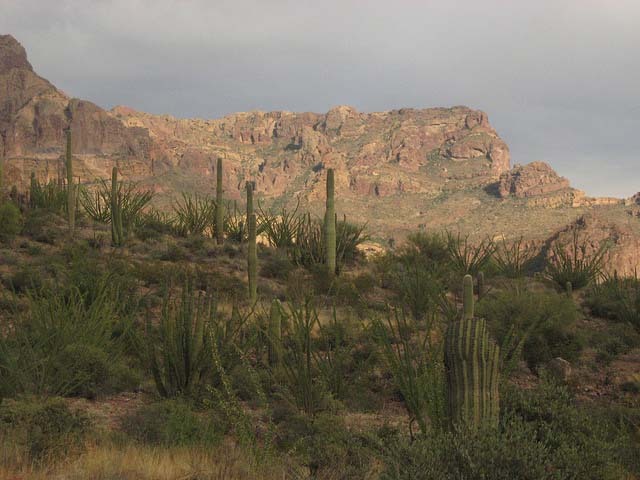 On the border of Mexico, Organ Pipe Cactus National Monument is a Sonoran desert preserve full of cacti for you to admire. If you like birding, you’ll love it here. To check current road status, call the visitor center at 520-387-6849, ext 7302, between 8 a.m. and 5 p.m. (Note that it’s closed on Christmas, even though the park is open.) In winter the low temperatures are in the 40s on average; daytime temperatures can be in the 70s. 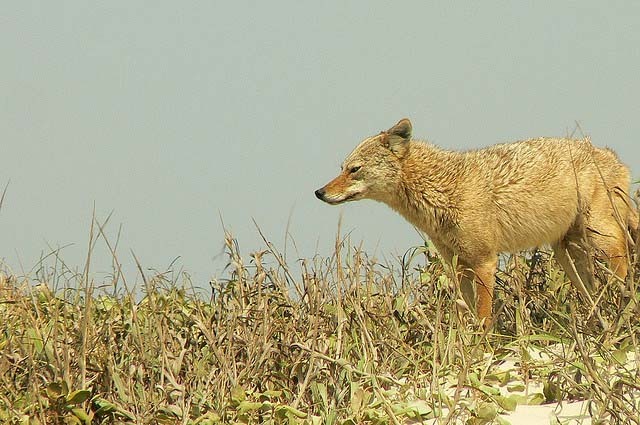 The Padre Island National Seashore in south Texas is an animal lover’s coastal paradise. It’s the longest stretch of undeveloped barrier island in the entire world. Think white sandy beaches, sea turtles, prairie, and the Gulf of Mexico. All camping is first come-first served; no reservations allowed. The website says it’s open year-round “weather permitting.” If you arrive when the park entrance is closed, you can still enter and go the next morning to buy a pass. Also, the park has no gas station and the nearest one is 12 miles away. So fuel up before you go! Great Sand Dunes National Park is where you’ll find the tallest sand dunes in North America. The area is void of sound, so it’s a complete break from modern civilization. It’s open 24 hours a day. In winter you go sledding, skiing, snowboarding, and wildlife watching. Although Piñon Flats Campground in the park is closed in winter, there are places nearby where you can camp. Zapata Falls Campground is the closest. It’s located at 9,000 feet elevation, 7 miles southwest of the park. From it you can see the valley and dunes. It has 23 sites and no reservations allowed. Open year-round. For more options visit this page. 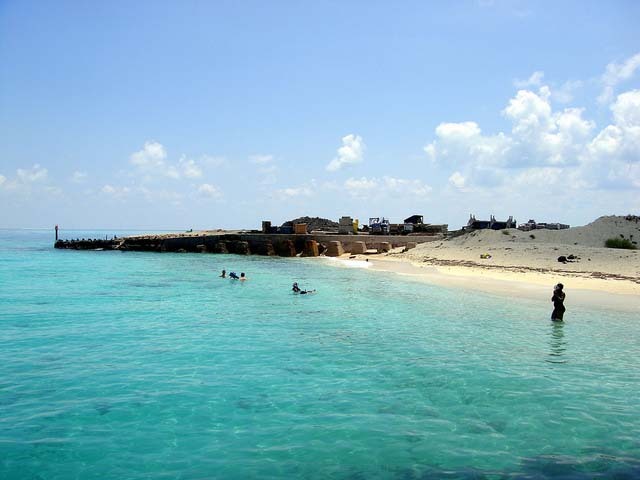 When you think of winter camping in Dry Tortugas National Park, think of islands, snorkeling in perfectly clear waters, coral reefs, birding, camping, and Fort Jefferson, the biggest masonry structure in the Americas, built in the 19th century. It’s 70 miles west of Key West and 100 square miles in size. The park is open year-round. But some islands aren’t accessible to the public — or at least not during certain periods. For example, Buch Key is usually open from October to January only; the rest of the time it’s closed because of the sooty tern nesting season. As of November 2017, these were completely closed year-round: East Key, Middle Key, Hospital Key and Long Key. When it comes to camping in the park, the only place is the Garden Key Campground, which is south of Fort Jefferson. Be aware that there’s only transportation available to you: the Yankee Freedom Ferry, which only takes 10 people per day! So you’ll definitely want to make reservations before you book a trip there. Do you have any winter camping places you love? Don’t froget Joshua Tree National Park and the areas in the Mojave Desert. Cold at night but good temps during the day. You need to do some more indepth research. I know for a fact that you can’t camp at the Pinon Flats campground at the Sand Dunes National Park in winter. How many more places on your list don’t have open campgrounds in winter? Hey, Andrew. Thanks for the feedback. I just re-checked all the places to make sure you can camp there in winter. You’re right that you can’t camp in Pinon Flats in winter — they close from November through March. But you can camp fairly near the park in the campground I added, and the park is open year-round. Let me know if there are other winter camping spots you think are worth sharing!